Smiling to my toes and happy… I got ready for work with the music blasting, dancing through the house between the bathroom and my bedroom looking for something to wear. High on love and anticipation. Make-up done, hair in pigtails… and my phone rings. My little brother!!! I love him the best and we connect even though we didn’t grow up together. I answer and he’s quiet. B- I have bad news. Dad died. Time stops for a second when you hear this sort of news. Everything seems too loud….and I have 20 minutes to get to work. Totally and completely in shock and facing a busy night with the BCS Championship game on. I was on autopilot all night. Coasting through a packed restaurant and somehow ending up with all the little tables. Thank God too, because I’m definitely not very chipper. Everybody was happy and watching the game, so it was easily managed chaos all night. My last table was my favorite Ms. Sassypants- who I’ve missed. I swear she tipped me more than the total of her tab, lol… I sat down at the bar with a beer and sunk into it finally. Grief… such an overwhelming feeling. I met my Dad for the first time when I was 8 years old. I’d asked my mom if I could meet him and we were visiting family in Utah. He agreed and we had lunch at Wendy’s. First time I ever had a chocolate frosty and a cheeseburger. He didn’t know we were vegetarians and didn’t ask what I wanted. My only clear memory beyond the food was that nobody said anything. Super awkward… and we parted with a wave. He sued my mom for custody a month later, and won holiday visitation with me every year. Spring break, summer vacation & Christmas. I remember it being a strange feeling to see someone that I looked so much like, and didn’t know. I was never comfortable with him, ever. He just never really was my dad. My dad was the one who drove me to school and baked my birthday cake. He blessed me with a brother and two sisters that I love more than anything. He gave me another mom in my siblings mother. Then he divorced her and never took care of any of us ever again. No child support, no call on your birthday. Nada. King Deadbeat. I bought myself a ticket to go see him when I was sixteen. It was Christmas, and I missed my siblings and knew he’d have them for the holiday. He spent the entire time with his girlfriend and I left and went to stay with my Aunt instead. He never forgave me for it. I tried to mend things with him after my son was born, about 4 years later. We stopped by my grandparents house for a visit and he spent a half hour calling himself Grandpa to a two year old that clung to my thigh and eyed him warily. For good reason, considering it was the only time he ever saw him. He never met my daughter. I sent pictures when she was born, and we sent him a Christmas package. I sewed him a quilt, and tried one last time to salvage some sort of relationship with him. Something about the birth of my own children made me want to fix everything. He said he never got it… but the confirmation came through that he had. I’m not sure why he’d lie about it… but he did… and it was the last straw. I wrote him one last letter, and never spoke to or saw him again. I told him about all the holes his absence left in my childhood, and about the dad I made up to tell people because he was so unmentionable. 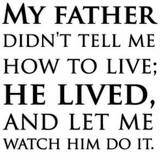 I gave all the hurt and the pain and disappointment every kid with a deadbeat dad can empathize with- back to him. I told him how much I hated him for what he made my mother go through & thanked him for my promiscuity and early entry into parenthood. Not necessarily what every dad wants to read, and certainly not entirely his fault on every level… but I went above and beyond to hurt him in return. I never heard from him again…. so those angry hurtful words are the last thing my dad heard from me. He was 56, and died alone, when he had four of the most loving people in the world as his children. Talk about the definition of tragic. I’m too happy and too much in love to be angry or hurt by him anymore. I feel sorry for him more than anything, and I wish I’d left him with nice words in his heart instead of the rant he got. He deserved it- for sure- but on a personal level it’s hard to fathom that there’s not time to fix it anymore. He’s gone, never having been my dad… or my children’s grandfather. I can’t mourn him like I should because I don’t have any way of knowing what a loss it is. So I’m tossing words on up to heaven… or down to hell if that’s where he ended up. I’m on the fence about either place but if the rumors are true and you have to be virtuous to get in? He’s heading south. Sorry, but it’s true. Whoa… time ran out, huh? I didn’t see that coming, and I’m sorry that you died alone like I told you I hoped you would. It could have been so different, and I’m sorry you died with so many things left undone and so many apologies left unsaid. You missed all of your children’s weddings. All three of your daughters were given away by someone else. You didn’t know any of your seven grandchildren, many of whom look like you. I am so sorry for you that you missed so much. Thank you for our beautiful smiles- that look just like yours. Thank you for the strength you taught all of us in not being reliable. Thank you for the fine examples of women you gave us by forcing our mothers to raise us alone. You had amazing taste in women, truly. You fed me steak and crawdads for the first time. Thank you- I love both ♥ You taught me how to fish in the summer and spent days in the sun chasing lizards with us at Flaming Gorge. You were a pretty awesome Disneyland dad when you wanted to be. You bought me my first designer jeans… bright red even. You spoiled me rotten when I was in front of you, and you always told me you loved me. More than anything though… you get out of life what you put into it. You taught me to love out loud and sincerely, and to follow up my words with actions because integrity is rare. Though you didn’t help much in the shaping of who I’ve become, you gave me life and the tools I needed to make mine a happy one. I love you- and I hope your soul is at peace. It’s such a waste when fathers can just walk away and distance themselves from their own children. My father did the same thing. I spent two amazing weeks in California, where he lived. Me and my best friend flew out. It was 1974, and my dad dressed like a hippie. In the pictures we took at Universal Studios, he’s wearing bellbottoms with a blue sky and white puffy cloud print, and red bandana print shirt. He was in his 30’s. He had five more children after he and my mother divorced, and later walked away from the three of them that I met when I was in California. He actually gave up all parental rights and they were placed in the care of a loving family who had been in their lives for a long time. I don’t know what happened to my two little brothers he had with a Swedish girl a year younger than I. Both those boys looked like adorable little leprechauns, with red hair, fair skin, freckles, pudgy little bodies and blue eyes. I have no idea where any of them are. As a child and a teenager, I idolized him, although of course he didn’t deserve it. After I came back from California, he sent me dozens of letters declaring his fatherly devotion, how spending time with me had changed his life, blah blah blah… Then the letters suddenly stopped. I saw him once more after that, when I was 25. That’s when I met his wife from Sweden and their firstborn. He was often irritable with the boy, impatient in general and, I thought, rather rude to his wife. I never saw him again after that, and I’m 52 years old now. Why is it that so many men seem so cavalier about being with their kids, sharing their lives and watching them grow up? Are they lacking in certain genes that moms have in abundance? I don’t mean to vilify all dads and declare that all women are good mother. 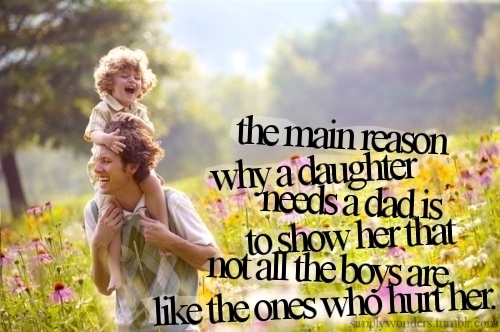 It’s just that it’s much more common for fathers to walk away. And most of them will never know what they’re missing. That is truly tragic. Sounds like you had a great father in your stepdad and it’s great that you are close to all your siblings. It’s a shame that your father never let himself get close enough to know his kids. My mama said it best this morning when she called. M- Honey, you lost him a long time ago, you’ve already grieved the loss. I can’t imagine dying before ever having done something I could be proud of- in fact if there were ever a definition of hell, that would be it for me. You truly are a beautiful soul Jen. Thank you for sharing this heartfelt glimpse into your world. I am so sorry to hear of your dad’s death. Although he sounds like he never made the grade in many ways, I know the death of someone can be the loss of the futures we are half hoping might just come to be. I really admire you for finding the pluses mixed in with all that was missing and wish you luck grabbing happiness. THis is so beautiful, sad, inspiring, raw and honest. Thank you so much for sharing such a personal expereince and thoughts. Thank you for such kind words, I really wish it could be nicer, but there ya have it…. I have a ring that says “regardless of desire, life hands you who you are” and it sure makes me think of him lately. Thanks! I have the day off and I’ve been craving a quiet afternoon in the library- I’ll look for it. As a man and a father, I can’t even come remotely close to imagining not wanting to see my kids. I mean, sure, there are times we all want to get away from them, but after a few hours, I end up texting whoever we left in charge and asking about them. I love my kids, and stories like this are tragic to me. This guy has no idea what he missed. Has no idea what he walked away from. No offense to you, Jenni, but he was an idiot. The thrill of seeing your kids grow up is one of life’s greatest joys, and my favorite sound of all time is my children laughing. I am glad you had a father anyway. The guy who gave you away, not the guy who gave you up. He is pretty great for marrying you along with your mom. That’s how I look at it, because I did that too. My wife had a daughter when I met her, because her husband left. And now we have my wife’s niece, because my brother in law abandoned her. And it just blows my mind. It makes me want to go stabbity on them, so to speak. But, I’m all well-adjusted and stuff (no really – don’t let my blog fool you!) so I would never actually do that. I’m sorry to hear about your dad. I admire the way you can extract the positive memories of him and keep them close to your heart. Not having him around may have helped that process. Lord knows there are plenty of dads who stick around, only to do that poorly and negatively influence their kids on a daily basis. Be kind to yourself dear! Yep. That feeling I know. 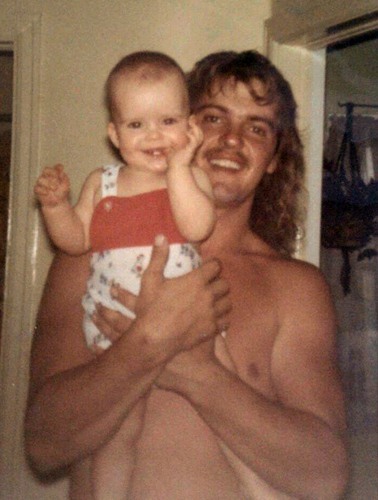 I have never met (nor seen a picture of, even) my biological father. I think I have siblings; but not sure on those details either. While there’s a part of me that would like to meet him, see pictures; get more information etc, because I had heard he’s spent time in jail, makes me wary of introducing that into my family. Maybe when the kid are older……….. I think they could probably find me if they wanted to- my bio dad ran into bio mom a few years ago. I do know the kids on that side of the family. Honestly, I think I probably would if I didn’t already have siblings- I grew up as the 4th out of 8 (only two of us were adopted). My (1/2) sister and I do resemble each other, but are totally different- there is, oddly enough, not a whole lot in common there. And knowing how the bio dad’s family felt about me (as in, I was a “dead horse”) has not particularly endeared them to me, even though I know siblings weren’t around then at all. It may come to pass at some point, but it’s not on my bucket list….. 🙂 It just feels like it could create more drama in my life that I really don’t need. Glad you have such a good relationship with yours, though!